The driver climbs out of the cabin, stretches his legs after the long drive, and opens the rear doors to reveal a compactly packed, neatly organized system: suitcases in different sizes, duffel bags, guitar cases, a complete sound system, and even camping gear — just in case. Only he knows how to stack properly all these items which have become essential for life on the road. Everything from dishes to towels, from CDs to laptops, from extension cords to repair tools has to fit into that tight space. ‘María’ is a 1991 GMC Vandura and she has seen quite a bit of the world. As have her two passengers, María Volonté and Kevin Carrel Footer. The couple has been touring the American West Coast, the East Coast, and most states in between in this vehicle for about a decade. They make a remarkable pair, she being a well-known, striking Argentine tango singer-songwriter and guitarist whose talent was discovered by her late husband. Surprised, when he found out one day that it was his young wife singing in the kitchen and not, as he had assumed, someone on the radio, he urged her to train to become a singer. Encouraged by his confidence in her talent, she took his advice and has since risen to become one of the most critically acclaimed performers and innovators of Argentine tango. Her partner on the other hand seems at first glance like the casual guy from next door, but is in fact the singer’s strong creative counterpart and at the same time acts as the duo’s super-efficient manager. He organizes and controls every aspect of the business down to the last detail. This journalist-turned-harmonica player, originally from Oakland, California, ended up by chance in Buenos Aires in the early nineties, trying to piece his life together after a failed marriage back home in the States. By coincidence he stumbled into the world of Argentine tango where he eventually found himself, the multi-facetted world of tango becoming his life. When their paths crossed, they each had built a respectable career for themselves. María’s had already stretched over more than two decades, both as a solo artist as well as with her own trio. She had won the prestigious Carlos Gardel Award, had been nominated for a Latin Grammy Award, and had been inducted into the Tango Hall of Fame. She had performed across Latin America, the United States, and Europe — where she most memorably sang the title role in the Piazzolla opera ‘María de Buenos Aires’ for a stage production in Munich. Kevin was a writer and photographer whose pictures of people in tango appeared in international magazines and on the covers of award-winning CDs. And he played the harmonica, an instrument he had learned to master on his own journey to the birthplace of the blues, the Mississippi delta. This small wind instrument had long been considered just a kid’s instrument in Argentina. But thanks to innovative artists like harmonica-player and composer Hugo Díaz it had been accepted as a lead instrument in modern tango, equal to the bandoneon. blues and Argentine tango — these two musical genres began to merge when María Volonté and Kevin Carrel Footer joined forces. They labeled their new fusion Blue Tango Project. It is a work in progress: as they state on their website, a very personal and unique way of exploring and interpreting “the emotional and musical crossroads where tango and the blues embrace”. They consider their musical project a “road-centric approach to life”. This statement can be taken quite literally since, after starting their creative union at the 2008 San Francisco Jazz Festival, the couple spends the better part of every year on the road.Their new lifestyle began when they gave up their permanent home in a quaint neighborhood of Oakland. “We threw everything out!” recalls María with a sweeping arm movement. After which they prepared for their life on wheels by converting the white van into a well-equipped mobile home. From then on they would stay during the first six months of the year at their home in Buenos Aires and then spend the second half of the year in North America, with occasional engagements in Europe. The white Vandura remains parked at a safe location in Oakland after each tour and gets pulled out again in mid-summer for a thorough inspection and overhaul before it hits the road again. What sounds like the romantic life of two traveling bards is in fact hard work. The tightly packed Vandura can almost be seen as symbolic for the down-to-the-last-detail meticulously organized, daily life of these two musicians. My partner and I got to know them over the past year when we plunged into the adventure of preparing several gigs in upstate New York and Northern California. By becoming a small part of their five-month strenuous tour, we got a glimpse of their tightly organized life and the discipline it takes to pull off such an endeavor. 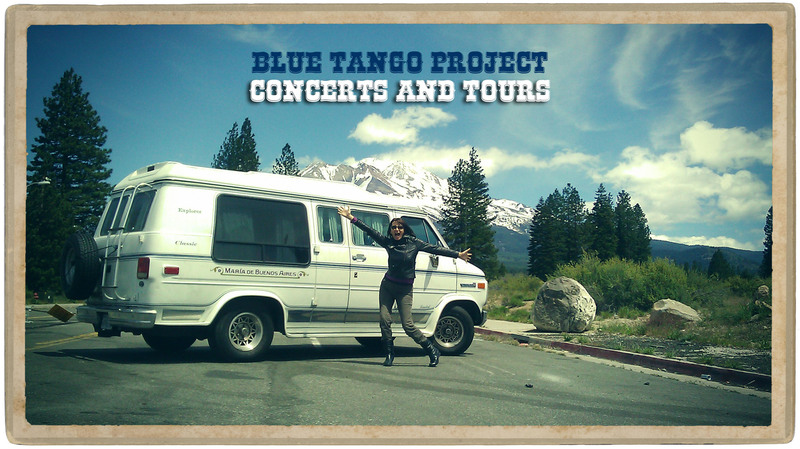 It may seem a strenuous lifestyle, but as a look at their websites — https://mariavolonte.com and www.bluetangoproject.com makes clear it is a successful and enjoyable lifestyle and one that shows no sign of slowing down. Next Next post: Tango wins a Grammy!